Shapes Beak-like pod about one inch long. As it matures, the carpels retract and the tiny seed are expelled away from the mother plant. 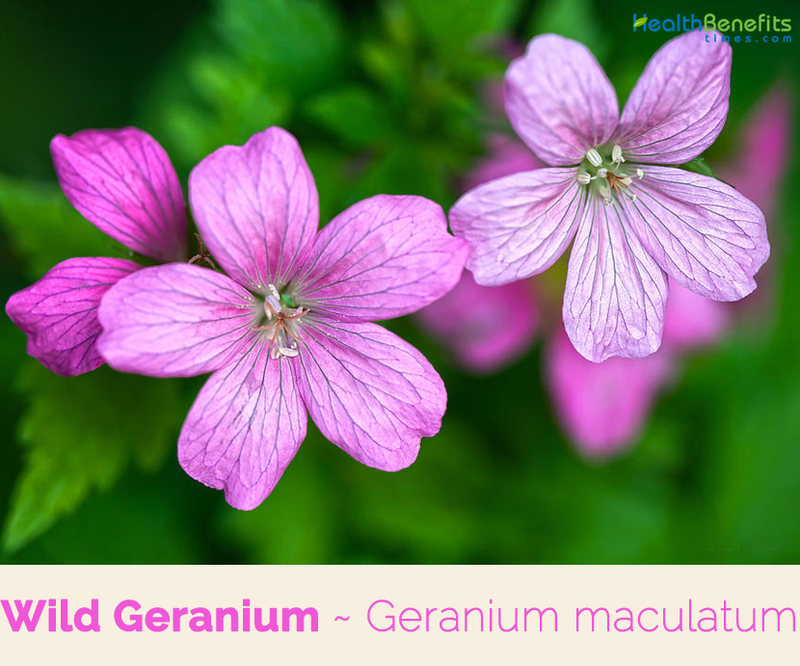 Geranium maculatum commonly known as Wild Geranium is a clump-forming woodland perennial plant from the genus Geranium and belongs to the Geraniaceae family. The plant is native to eastern North America, all the way from Manitoba and Quebec to Alabama and west to Oklahoma and South Dakota. 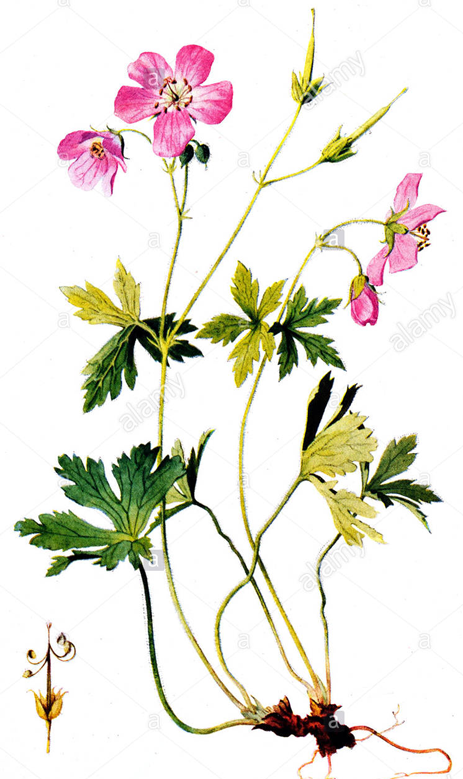 Apart from wild geranium the plant is also known as spotted Cranesbill, spotted geranium, crowfoot, cranesbill, wild crane’s-bill, American cranesbill, alumroot, alum bloom, storks bill, chocolate flower, old Maid’s Night Cap, rockweed, sailor’s Knot and shame face. Geranium is derived from the Greek word geranos, which means crane. Though this name seems questioning, it actually refers to the shape of the seed pod, not the flower. 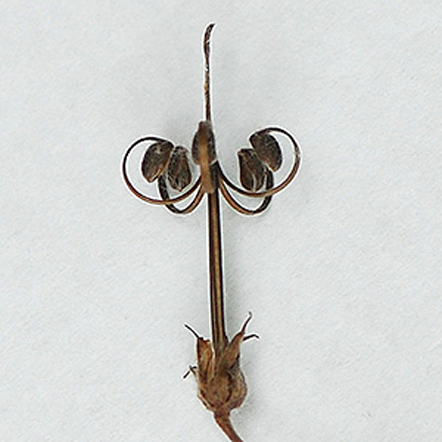 Papery seed capsules, which split lengthwise into five long peels, look like a crane or stork. Cranesbill and Storksbill are two other common names of Wild Geranium describing this likeness. Maculatum, the species name, means mottled and refers to the dark greenish- brown leaves which are rather mottled. However we call this flower Wild Geranium, “wild” is truly a contradiction. Wild Geranium is actually a true geranium. The term wild is used to differentiate this flower from other false species. Wild germanium is a moulding rhizomatous, clump-forming herbaceous perennial ground cover that grows about 2 feet (60 cm) tall and 18 inches (45 cm) wide. The plant is found growing in woodland areas, thickets, wet or damp places, in swamps, marshes, moist woodlands, mesic deciduous woods, alluvial forests, upland woods, savannas, meadows, shaded seeps, rocky glades and moist prairies from adjacent woods. The plant is easily grown in moist, average, medium, well-drained humusy soil in full sun to part shade. Plants usually tolerate loamy, sandy or poor infertile soils, acidic pH, short term drought and full sun if adequate moisture is present. The plant has creeping roots that are woody, knotty, and about 1 inch thick, with creamy white centers. 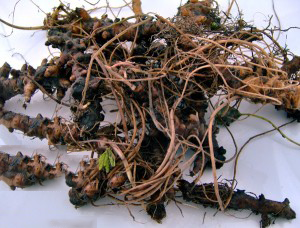 Rhizomes are long, and 5 to 10 cm (2 to 4 in) thick, with numerous branches. It is covered with scars, showing the remains of stems of previous year’s growth. When dry it has a somewhat purplish color internally. The leaves are semi evergreen, opposite, palmately lobed with five or seven deeply cut lobes, 10–12.5 cm (4–5 in) broad, with a petiole up to 30 cm (12 in) long and pubescent with green to reddish color arising from the rootstock. They are deeply parted into three or five divisions, each of which is again cleft and toothed. The leaf margin is irregularly and coarsely toothed or cleft all around. Leaf surface is medium green and pubescent. 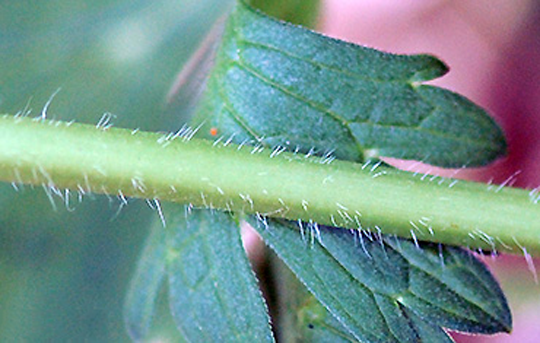 Lower leaf surface has coarse white hairs like those on the petiole while the upper surface is covered with fine white hairs. The upturned flowers are borne at the top of hairy stems in loose clusters of 2-5 (a corymb or floppy umbel). Each 2.5–4 cm (1.0–1.6 in) diameter flower has five rounded petals, five green sepals and ten yellow stamens surrounding the single pistil with five carpels. The petals are generally rose-pink to lavender, but may be darker purple or rarely white, with fine, slightly darker-colored lines running along their length that function as nectar guides. The petals are marked with darker lines along the length, and often fade to white at the base. The 5 green sepals behind the flower are about half as long as the petals, and hairy. In the Northern Hemisphere, they appear from April to June (precise dates depend on the latitude). 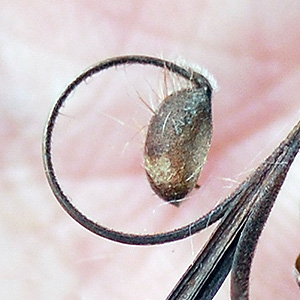 Flowers are followed by an erect beak-like seed capsule, covered with hair, develops at maturity. The capsule has five cells, each containing one seed and when mature, the outer carpels of the capsule curl backward to expose the seeds. 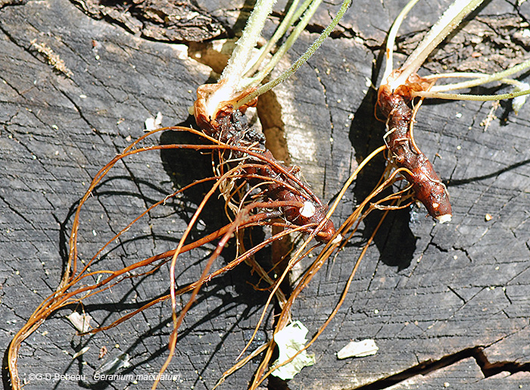 The central stem then extends upward raising the 5 seeds, each then uncoiling its own spring-like stalk, with the remnants of the style held above them. The entire contraption resembles a wrought iron chandelier with five lamps. 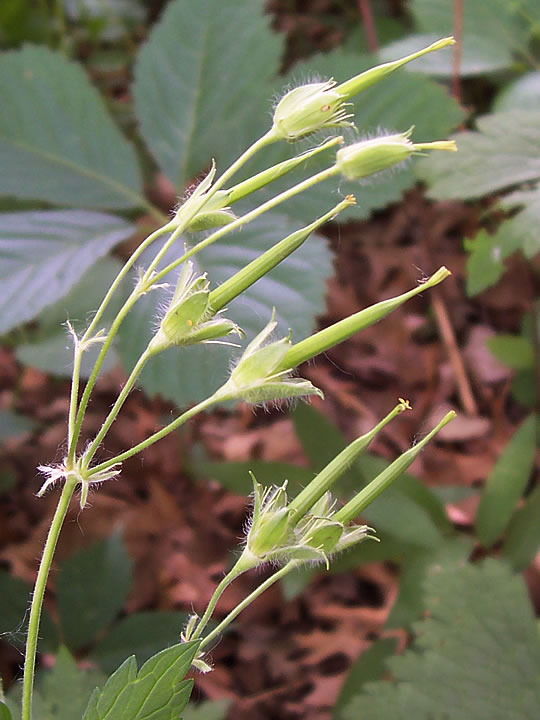 Each seed has long hairs attached and the coiled stalks have very short hairs. 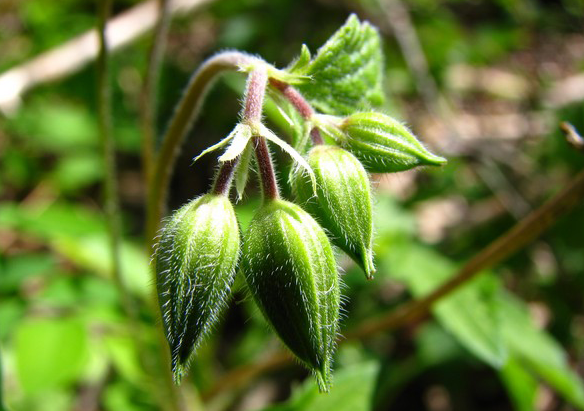 Wild Geranium is an astringent herb that can be used as a mouth rinse to soothe the pain of canker sores. The herb consists of good amount of tannins that can bind up fluids and possibly relieve inflammation. They are used as a mouth rinse and then are spit out. 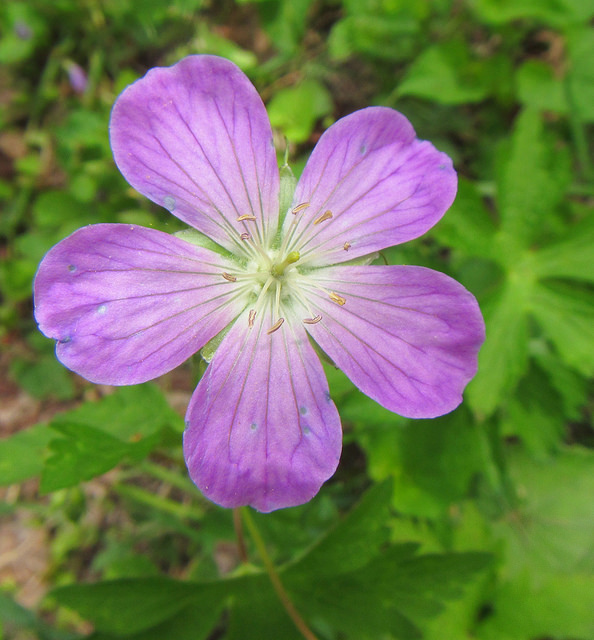 Wild Geranium has been used by several North American indigenous tribes to treat diarrhea. 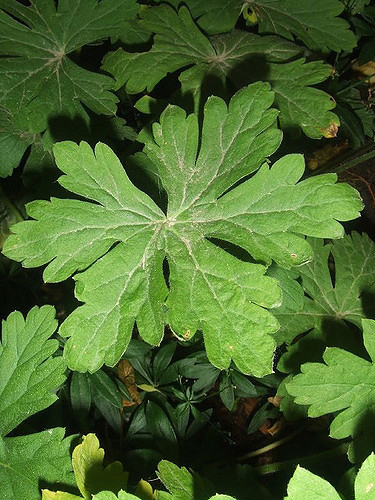 The tannins in cranesbill likely account for the anti-diarrheal activity. It has been used by several of the indigenous tribes of North America to treat diarrhea. The tannins in Wild Geranium likely account for the anti-diarrheal activity—although there has been little scientific research to clarify Wild Geranium’s constituents and actions. Whole plant, but especially the root, is antiseptic, highly astringent, diuretic, styptic and tonic. An infusion of the whole plant, or of the roots alone, is used in the treatment of diarrhea, dysentery, irritable bowel syndrome, cholera, kidney complaints, bleeding and a wide range of other ailments. Externally, it is applied to purulent wounds, hemorrhoids, thrush, vaginal discharges and inflammations of the mouth. 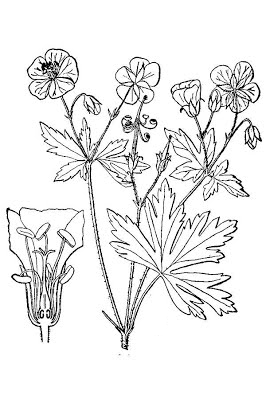 Root and rhizome of Wild Geranium plant is used in herbal medicine. 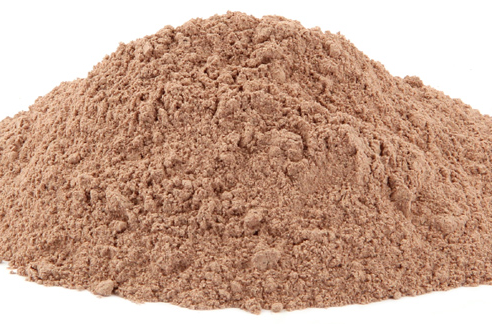 Powdered form of root is used to heal Wounds and Swollen feet. Fresh leaves are used to treat Insect stings and as a Mosquito repellent. Cranesbill is used to stop abnormal bleeding related to Menstruation and Uterine problems. It can be used as a Mouthwash or gargle for mouth and throat inflammation, tonsillitis and toothaches. It is effective against bacteria causing Tuberculosis. 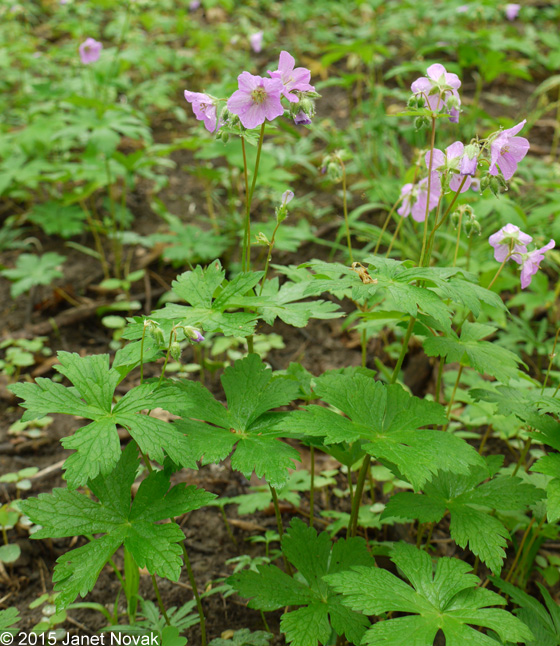 Wild geranium is a woodland herb whose roots can be gathered for the herbal apothecary as a helpful remedy for an upset stomach. Leaf tea is a good beverage to sip to soothe a sour or upset stomach. Leaves can also be used as an astringent mouthwash or as a topical field medicine to wash wet, weepy rashes and wounds, common foragers’ ailments. It was used as eyewash and the powdered root, often mixed with other herbs, was used as a compress on wounds and swollen feet. Ojibwe or Chippewa used the dried and powdered roots (rhizomes) to remedy mouth ulcers, inflamed gums and sore throat. Blackfoot tribe used it to stop hemorrhages. 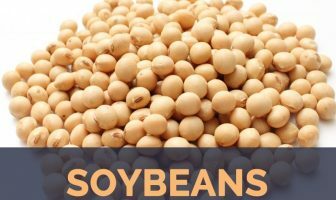 Plant was later used by the European settlers in North America for diarrhea, internal bleeding, cholera and sexually transmitted diseases. It possesses hemostatic properties and can work as an agent to stop internal hemorrhages. Herb is used for hemoptysis, hematuria and heavy menstrual bleeding and externally to stop bleeding and heal wounds. The herb can be effective against thrush, inflammation of the mouth and throat, tonsillitis and toothaches. It has been found that it is very active against the bacteria that cause tuberculosis. Chippewa Indians used dried, powdered rhizomes mixed with grape juice as a mouthwash for children with thrush. Poultice from the base or pounded roots of the plant was used to treat burns and hemorrhoids. Boiled root was also used for toothache and crushed to a paste applied to piles. It was used to staunch hemorrhages in the lungs, uterus, bowels and stomach as well as being used for excessive nosebleeds. Lotion made from the root was applied to runny eyes. Root, with cayenne pepper was made into a decoction for typhoid fever and childhood cholera. In the 19th century the root was used as a remedy for gastric ulcers, to relieve pain and perhaps to cure them. An infusion of the root was given for kidney troubles and to stop a heavy menstrual flow and for period irregularities in general. 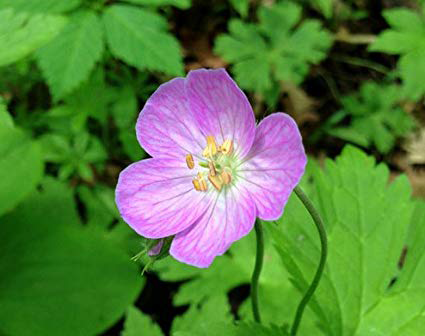 Aphthous Ulcers: Wash the ulcers from wild geranium extract twice or thrice a day. 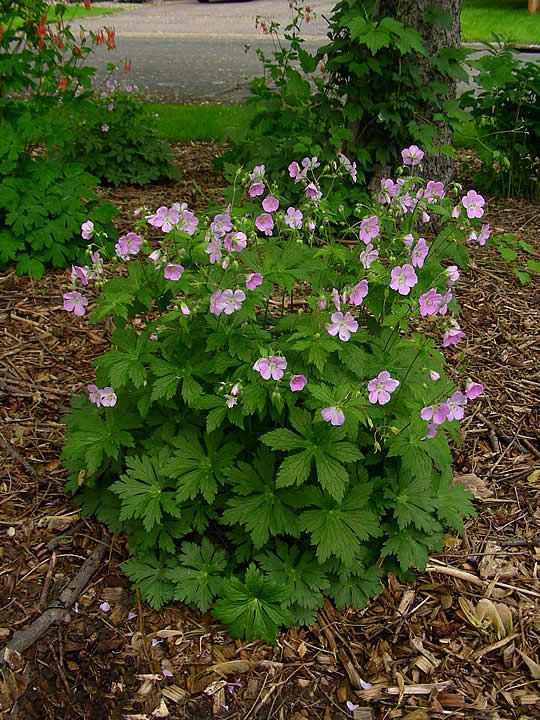 Diarrhea: Put 1-2 tsp of the wild Geranium rhizomes in a cup of water. Boil. Simmer for 10-15 minutes. Drink three times a day. Swelling: Mix Wild Geranium root powder, Talcum Powder and Phellodendron Amurense bark powder gently. Apply the mixed powder locally on the swollen region. Dysentery: Prepare a decoction of Wild Geranium, Echinacea, Ipecacuanha. Use two-three times a day. A brown dye is obtained from the flowers. The roots and the leaves are rich in tannin. Plants are suitable for ground cover when spaced about 45 cm apart each way. The fresh leaves can also be rubbed on insect stings and used as a mosquito repellant. The root contains large amounts of tannins which can be toxic to the liver if used for long periods. Geranium maculatum f. albiflorum Raf. Geranium maculatum var. albiflorum Raf. Geranium maculatum var. diphyllum Raf. Geranium maculatum var. humile Raf. Geranium maculatum var. macrophyllum Raf. Geranium maculatum var. viride Raf.